Make a Splash at H2Oooohh! View the 2019 calendar, rates, and locals deal below! H20ooohh! is a family indoor waterpark located in the Town Center at Split Rock Resort. With 53,326 square feet of water attractions to enjoy, H20ooohh! has three four-story slides, a wavepool, activity pool, Jungle play structure with dumping bucket, and Leapin' Lillypads crossing area. I'm sorry we no longer have hot tubs available in the Waterpark. Most Fun for Ages 12 and under, Moderate Fun for Ages 13 and up and PRICELESS for Parents Having a Blast with Their Kids! We're home to Pennsylvania's first indoor Flow Rider. Relax with a drink from our Island Oasis Snack Shack. Plan an unforgettable birthday party or other event at the water park with our Party Packages. Choose from several fun packages or customize the options to suit your special celebration. Email mray@splitrockresort.com or call 570-215-6106 for more information on birthday parties! Girl Scouts & Boy Scouts can earn an Experience Patch at our Park. Get other groups together and do a joint buyout of the Waterpark! Remember to bring your own towel. We do not allow ANY outside food & beverage into the waterpark. No coolers allowed! I'm sorry we no longer have hot tubs available in the Waterpark. Towels are also available for purchase in the gift shop. Want the park all to yourself? Rates vary during season. Please check the correct chart below for the corresponding ticket rate. Day passes may be limited when Split Rock Resort is at capacity. Rates are subject to change without notice. I'm sorry we no longer have hot tubs available in the Waterpark. Residents of Carbon, Luzerne, and Monroe Counties Receive a Special Locals Discount Feb-May, 2019! Black out dates apply! Click here for our Locals Deal Details! Check out our FULL SCHEDULE BELOW for 2019, including our "Extra Hours" Nights! Tickets can be purchased online via the website up to 24 hours in advance. Within 24 hours of arrival all tickets must be purchased at the Waterpark Front Desk. 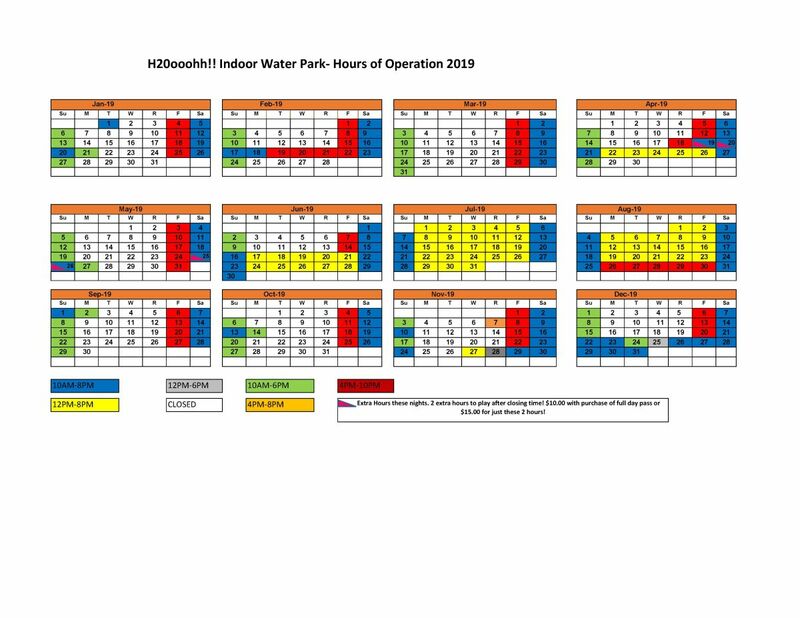 After Hours tickets can only be purchased day of at the Waterpark Front Desk. *Hours and open dates are subject to change. *Twilight pricing is not available on holidays and peak days. For more information view our Frequently Asked Questions or call (570) 722-9111 ext 789. I'm sorry we no longer have hot tubs available in the Waterpark.